While many hotels still rely on manual credit card authorization forms to guarantee a room reservation, this process is needlessly exposing them to greater fraud potential and charge-backs since the card information is not secure. 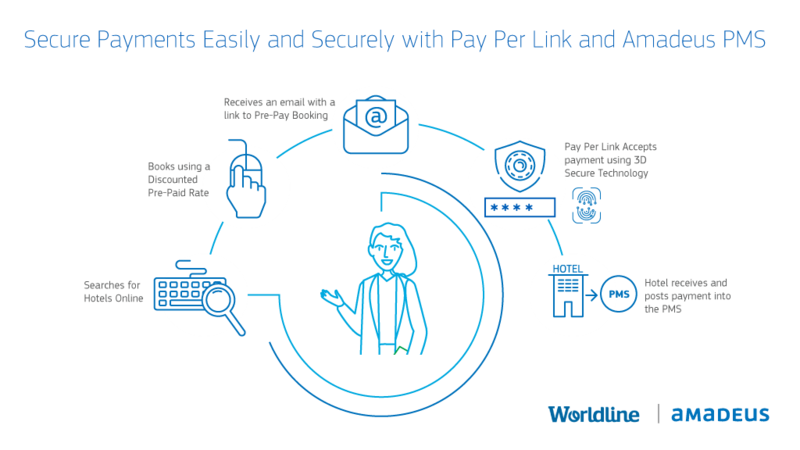 Pay Per Link from Worldline not only solves this problem but also helps hotels increase revenue. How? With a pre-paid reservation rate strategy, the hotel can offer guests a discounted rate upfront that is non-refundable. The guest has the added incentive to book at a discounted rate, while the hotel receives a secure payment in full that is then entered into Amadeus IDPMS without actually storing the card data. Travelers who’ve paid up front are less likely to cancel than those with a flexible rate, giving hoteliers more piece of mind to forecast their business. It’s a win-win for the property and guests! To see the Pay Per Link and Amadeus partnership in action, read our case study from XO Hotels.